With their CBA-imposed week break, along with the All-Star Break, now staring them in the face, it would be in their best interests for the Buffalo Sabres to take this time to re-evaluate themselves. The team needs to think hard and figure out what it is that they are trying to accomplish in these final 34 games. It truly is now or never for the Buffalo Sabres. Coming into this season, it was all about a rebuilding year. Find out who will fill what role and who will take their development to the next level. Many agree that as soon as Buffalo ran off ten-straight wins, those expectations were shot into the stratosphere. While those surrounding the team still contend this is a rebuilding season, the team has played well enough that those expectations might be able to be adjusted. As we continue to hear more from Jason Botterill and those in the know around the NHL, it seems certain that the Sabres will stand pat with what they have – despite their noted, visible shortcomings. Phil Housley has approached these shortcomings by attempting multiple different line combinations, most of which have flamed out quick. It goes without saying but what the Sabres are lacking offensively is talent. Botterill has stated he does not want to make big deals for rental players at this time, which is a somewhat reasonable statement to make. Buffalo’s draft pick capital along with their young, developing players in Rochester and abroad, it does not appear to make sense to make a deal for a player who will likely walk in July. With that being said, hockey fans know how hard a true “hockey deal” is to make during the season. While sense is being made from multiple people in and out of the organization, the growing list of excuses for the team’s rapid regression is getting hard to deal with. The latest example of this was just this week, when Buffalo found themselves getting absolutely manhandled by Edmonton Oilers and then coming out the very next night to take down the Calgary Flames, the head of the class in the Pacific Division. Again, it is now or never for the Buffalo Sabres. It is hard to not get frustrated or downright upset with the seeming carelessness of this franchise. Staring a potential playoff berth directly in the face and how do they respond? By spitting the bit and completely losing any and all forward momentum they had built up. Since November 28, the day before the ten-game winning streak ended, Buffalo has amassed a record of 7-12-4. If it is a systems-issue, the Sabres need to figure it out. If it is a player-personnel issue, the Sabres need to figure it out. If it is a coaching issue, the Sabres need to figure it out. Coming out of the break, Buffalo should still be within striking distance in the Eastern Conference Wild Card race. A hot start out of All-Star Weekend would really help turn this team’s fortunes back around. 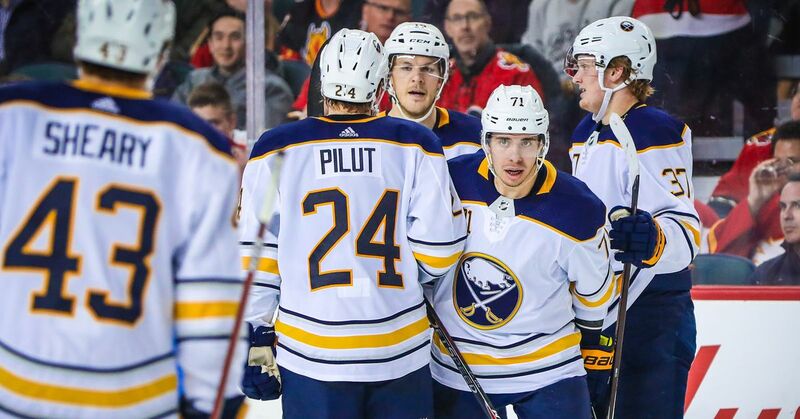 With seven of their next nine games at home, all while boasting a 14-6-3 record at the KeyBank Center, this team should have all the support it might need to get rolling. Whatever the case might be, the organization needs to figure it out. It truly is now or never for the Buffalo Sabres.